It is nearly the end of 2018 and I am still bemused about where the year has gone. I have just revisited my Caneground video and realised that Youtube has done something to the captions - they are no longer in sync, so will have to spend some time fixing that. Argh! How did I find time to go to work?. Since my last blog (it has been a while) I have re-visited some of my free patterns on this site and realised that they are great for those of us who can read a pattern with ease, but for the beginner lace maker they are not detailed enough. So using my Caneground bookmark that goes with the Caneground with Jenny Brandis Youtube video as an example - the original PDF file consisted of 1 page - the pricking and a couple of diagrams. This was a free download from this site and suited most of the lacemakers who alrady knew how to read a pattern. Now, however there are a total of 7 pages that are more professionally presented with detailed sections to assist the beginner to learn. 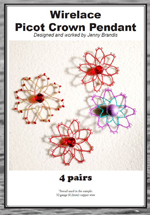 This PDF is available free from this site but is also available for sale through my JennyBrandisLace etsy store. This is deliberate - you have gone to the effort of finding my site and it acts as an advertisement of the standard my patterns are now at. As you can imagine, there are days of work involved in getting a pattern to this stage of professionalism. Did a short 4 minute tutorial video on Adding angled text to a Lace 8 design for the Lace8 Users Group on facebook. This is the 23rd Lace 8 specific video I have made since starting the group on 3 November 2015. Had a lovely time with my sister (the artist) doing a resin pour on an Ikea table. This one turned out much better than my first effort as we allowed more resin to cover the 5cm deep sides. Today has seen me glued to the laptop while trying to get Jenny Brandis Handcrafts website into some semblence of order. Everything else has been ..... less attended. Tea tonight is going to be a stew, yes, I am actually making it from scratch and for those who know me, you will appreciate the HUGE thing this is. What is in this stew? Well, the base is a chicken stock I made and froze after eating the meat off the bones. Then there is 3 potatoes, 4 carrots, 1 onion, 1 clove garlic, some pumpkin and the cubed ham. Crock pot on high for a few hours and have now added brocalie and mushrooms before turning the pot down to low. Will stew it for a couple more hours and (hopefully) have an enjoyable meal. Ok, enough procrastinating - time to get back to resorting the website. I sure hope people appreciate and like the new look and navigation list. Removed a lot of files that have not been well accessed so (please, pretty please) let me not have 404 errors all over the place. 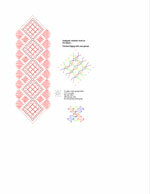 The computer has been running hot as I have been making PDF files of several of my lace designs. Every time I do this I think, there must be an easier way. So now I am using InDesign more effectively and have saved notes and pictures in their own library that I can access in later documents. It's a bit slower but I feel it will make life easier as the library fills out. Right now I have saved things like: Windmill crossing: Half Stitch Fan and French fan. 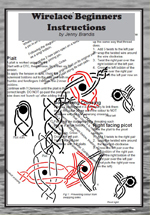 Added a new wirelace pattern to the etsy store JennyBrandisLace along with the notes/instructions on basic wirelace.